A middle aged male had chest pain. There was suspicion of acute MI. The QTc is 423 ms. 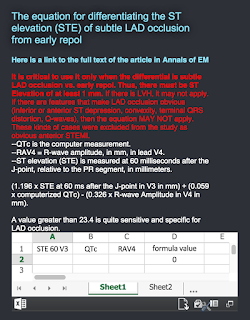 There is a large amount of ST elevation and Massive T-waves in V2 and V3, worrisome for LAD occlusion. However, there is also excellent R-wave progression. No definite change. Computerized QTc is 399 ms. The potassium was 4.5 mEq/L. Both of these ECGs are very worrisome for STEMI, but not diagnostic even though the second one meets criteria for STEMI (greater than 2 mm at the J-point in 2 consecutive leads). Early repolarization can look like this, however. Applying the formula to ECG 1, we get 22.025. This is about 97% sensitive for LAD occlusion at a cutoff of 22.0, and 92% sensitive at a cutoff of 23.4. If we apply to ECG 2 (which has MORE ST elevation), we get 19.63 (very low). This ECG is so worrisome that I would not be entirely convinced that this is not MI. But I would not activate the cath lab without more information if it is a strain on resources (nighttime, weekends, for instance). A formal echocardiogram with contrast was done and showed no anterior or apical wall motion abnormality. The patient ruled out for MI. 2. If it is STEMI, there will be a Regional Wall Motion abnormality. 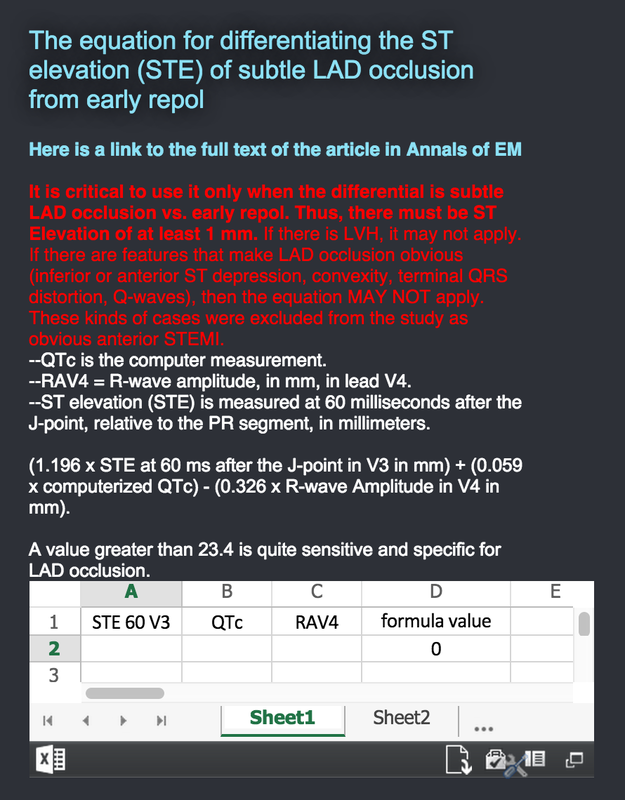 If the equation indicates Early repol and you don't want to overuse scarce resources, then obtain an emergency high quality ultrasound to look for a wall motion abnormality. How do you explain (in 2. ECG) the neg. T wave in III ? may be physiological, even healthy people may have t wave inversion at lead 3, you can check if it's not related to ischima if you ask them to take a deep breath and hold, and you will see it change back to normal.